A couple weeks ago, I wrote a few thoughts on Jenni Olson’s The Royal Road, which is a wonderful piece. I hope you can see it on a big screen some day. Jenni has kindly agreed to answer a couple of questions about her film and her approach to filmmaking. Happy reading, and thanks Jenni! 1) The Royal Road is situated somewhere between an exploration of American history and a personal essay on love. The Royal Road is most likely unknown to the vast majority of your viewers because, as you say in your film, there are only fragments of it left these days. Can you tell us a bit more about it and how you came about making a film about it? I moved to California from Minnesota in 1992. At some point after I’d been here awhile I started noticing there were these odd bells installed at certain points along the highway. I love finding unusual historical artifacts and researching their histories so that was the beginning of my interest in El Camino Real. I learned that they had been placed their in the early 1900s as a way of memorializing the original trail (but also as a way if encouraging tourists to drive up and down the state — remember this was around the time that automobiles were becoming more popular: You have a car, now here’s where you should go.) Using the road as the central organizing point for the film seemed like a great way to be able to talk about the more serious and generally lesser-known history of California (the decimation of the indigenous population by the Spanish colonizers and the conquest of Mexico by the US in the Mexican American War) while also using the road as a plot device to tell a story of a character going to visit her love interest from San Francisco to Los Angeles. 2) What brought you to filmmaking and what does filmmaking mean to you? What role does it play in your life? I have a deep and abiding love of cinema that began all the way back in my childhood. I loved watching classic Hollywood movies as a kid and I was a Film Studies major in college — where I also read Vito Russo’s pioneering book, The Celluloid Closet and then created the first gay and lesbian film series on campus (at the University of Minnesota in 1986) and started writing reviews of gay films for the local gay newspaper. I then became the festival co-director at Frameline: The San Francisco International LGBT Film Festival in 1992. It wasn’t until that point that I decided to actually make films myself, and even then they were always very modest productions. It’s only recently that I have realized that my style of urban landscape filmmaking is really just a natural outcome of the way I look at the world. I tend to envision the world around me as a series of compositions. I notice the qualities of the light, the textures and surfaces of buildings, the distance and depth of what is in front of me. And I feel compelled to try to capture this on film. 3) You said you felt compelled to try to capture qualities of light etc on film. Do you think you have succeeded doing this, or are you still looking for the perfect composition? I am extremely happy with the majority of the footage I’ve shot over the years. I have about five hours of footage total that I was working from to create the film. In this reservoir of images there are still tons of great shots I wasn’t able to fit into this film which will hopefully be in my next project. And I hope I will be able to continue shooting at some point in the future (I can’t afford to these days) and be able to make another film. 4) The film feels very personal. It feels as though, between the lines of history, we can read your film as a kind of autobiography. How autobiographical is the film? As a writer I like to use some kind of topic or thing as an area of exploration which helps provide a structure to my storytelling. I tend towards a very discursive style involving a lot of tangents and associations and allusions to other texts so it helps to have something in the center that I can circle around and bounce off of. Virginia Woolf once said something similar about To The Lighthouse and it has always stayed with me. She said that having the lighthouse as an organizing principle was the thing that enabled her to explore all these other emotions and topics. So I very much think of El Camino Real as a similar central device that organizes the film as a whole. 5) I get the impression that you’re very much drawn to literature. Having seen your film, I’m not surprised about that. Is your film perhaps a “visual novel” rather than the photo album I mentioned in my review? I like the idea of it as a visual novel but maybe creative non-fiction would be more accurate in terms of literary terms. I have a few different terms I’ve used to describe it: as an essay film, as a hybrid film, an experimental film. It has played in many documentary festivals simply as a documentary but it is of course more complicated than that. 6) You make extensive use of long-takes in the film. I had the feeling of sitting next to you while looking at photos you are telling me stories about. What’s the reason for those long-takes? Are they an aesthetic you generally use in your films? I have always felt drawn to urban landscape filmmaking as a mode of storytelling. The viewer is put into a certain unique state of receptiveness and is made susceptible to feeling their own emotions — the static, open space provides a calming, comforting reassurance that allows the viewer to relax and take in the voiceover. Ideally the images I like to capture are visually interesting in their compositions and content, and yet they are also somewhat mundane — they have to be not TOO visually interesting or else the viewer will be distracted by them. The length of the takes is also crucial to creating a spaciousness for the viewer. I always like to establish the grammar of the film in the first few shots so you know to expect these very long takes and can begin by experiencing the joy of just looking at the landscape, relaxing into it and starting to notice the small details of each shot which emerge as hugely dynamic given the minimalist palette of the film — so when a bird flies across the shot, or the light gets brighter or a puff of fog blows past it can actually take your breath away. I also especially love to have urban landscapes that seem somewhat timeless, as though they might have looked like this fifty years ago. So I crop out as much as possible things that look more contemporary and modern (like newer street signs, billboards and such). 7) Your voiceover is guiding the viewer through history, if you want, all the while seeing modern, but as you said timeless, urban landscapes. How, do you think, can your long-takes help the viewer reach a state of contemplation despite your voiceover providing a persistent auditory background of interesting information? I think this meditative state is not the same as actual sitting meditation where one is focusing on the breath per se. But it is in the realm of a meditative state in that one emerges in a more mindful and present state, attuned to the physical environment and seeing the world around us in more vivid attentive ways. 8) The film was shot in 16mm, which, unfortunately, isn’t all that common anymore. Why do you still work with 16mm film? I have a great affection for the look of 16mm film — the quality of the grain, the saturation of the colors and also the 4:3 aspect ratio since I shoot in regular 16mm, not Super 16. I have an underlying agenda in my filmmaking that is about the joys of being present in the moment, in the landscapes in which we live. In The Royal Road I talk about our exceptionally digital age and the importance of “staying connected to the physical, analog world in which we live.” And so there is something very organic about using actual film to create my films. 9) Do you develop the films yourself? I’m reminded of Ben Rivers who develops his films in his kitchen sink. No, I’ve always depended on the kindness of skilled and talented strangers to process the film (at Fotokem in Los Angeles). I’m dependent on many people to create my films and I’m especially grateful to my good friends Sophie Constantinou (my primary cinematographer) and Dawn Logsdon (my editor) for enabling me to fulfill my creative vision. 10) The 16mm film seems to disappear slowly. Are you worried that you will eventually lose your medium? Yes, when I talk about making my next film I do worry that I may not be able to pull it off simply because of the level of effort involved. And yet in some ways then it becomes even more compelling to me to continue to use this medium the more arcane it becomes. It really does feel organic to what I’m trying to achieve in my work — qualities of emotional resonance that actually arise from the medium itself (the grain of the image, the quality of light, etc.) The genuine qualities of feeling these generate in the viewer can’t be achieved through the digital medium even by using digital effects that try to recreate the qualities of film. I have to just conclude by saying that I have felt so impacted by the suicide of Chantal Akerman earlier this week and would like to take the opportunity to convey a brief appreciation of her as her work has had an enormous influence on me as a filmmaker over the years. I woke up to the news of her passing on October 6th (my 53rd birthday). As a pioneering filmmaker, Akerman is frequently celebrated for her portrayals of women characters and for elevating women’s stories and offering a unique female perspective in her films. All of which is the case. First and foremost though, she was a filmmaker with a singular vision whose distinctive approach to the possibilities of the medium encompassed a painstaking awareness of the smallest cinematic elements and their potential impact not just on conventional aspects of storytelling but on the emotional, psychological and physiological experience of the audience (of course I identify with this in my own filmmaking and feel deeply indebted to her as an influence). 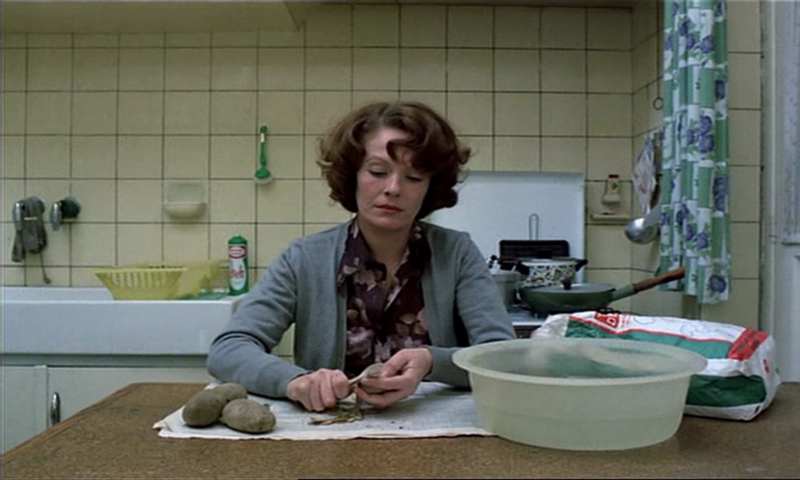 It is this consummate craftsmanship that produced such masterpieces as Jeanne Dielman, 23 quai du Commerce, 1080 Bruxelles. It is this craftsmanship that created so many stunning works of art that will change the way you see the world, and that will never leave you — even though their creator has. May her memory be for a blessing.